I have a generous selection of gorgeous wool yardage that was given to me a few years ago. I had said I would weave rag rugs with it. But I haven’t. …until now. What took me so long? Uncertainty. I haven’t seen wool rag rugs. What warp should I use? What sett? What problems await? I felt timid about walking into the unknown. Wool fabric has been washed and dried before cutting into strips for rag rug weaving. Four different wool fabrics have been chosen for this spaced rep rag rug. Last week I came across a recent Väv magazine. Lo and behold, here is a spaced rep rag rug with wool fabric weft! My loom is already dressed for spaced rep rag rugs. Here I go! 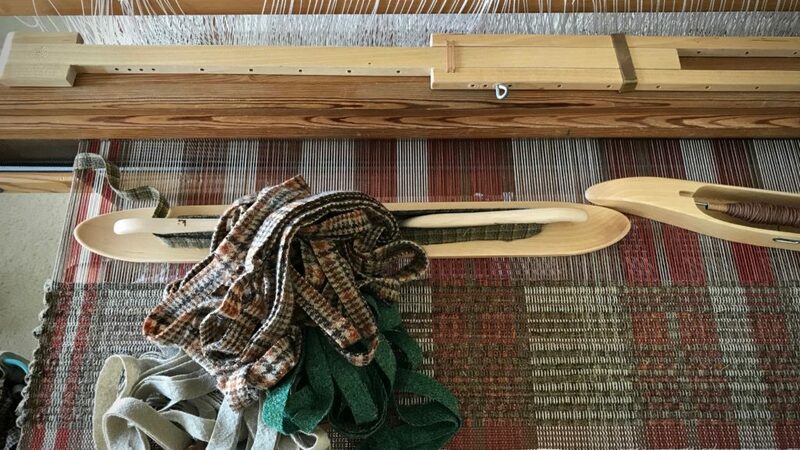 After a warp thread header, narrow fabric strips are woven for the hem of the rug. The wool selvedges are surprisingly soft. Weaving in the morning. A pick of brown 12/6 cotton warp thread follows the pick of wool fabric, except when changing blocks. Weaving consecutive fabric strips changes the blocks. Put your future in the hands of the one who holds the future. We speak of past, present, and future. But for the Lord, the present has already been. The future has already happened. It’s as if the wool rug that I try to imagine and weave has already been positioned in the foyer of the Father’s house to comfort road-weary feet that enter. Amazing! May your future be better than you imagine. Oh YES! A wool rag rug sings of warm toes in winter. Beautiful, beautiful. Hi Julia, Yes, I anticipate some happy toes around here. Lovely! I’ll bet the wool will be a bit more squishy to the foot than cotton. Hi Beth, I expect you are right! I remember some braided wool rugs that my grandmother had that were squishy like that. After a similar gift I wove some wool rag rugs years ago, but I used wool warp (commercial New Zealand “rug wool” from R & M) and they seemed much appreciated as gifts. But I spaced the warp (probably 6 epi) and wove them bound weave in twill and plain weave patterns. Now, I have received another such gift and am planning to do the same. (And thanks for the reminder about pre-washing…can’t remember if I did or not!) Really like your blocks, tho….! Hi Nanette, Your rugs sound like they were beautiful! A wool warp makes perfect sense! This for after the rugs! Hi Karen, I’m glad to know about this book by Mary Elva Erf — I just ordered a copy! Looks very interesting. Thanks so much for the tip. This rug is gorgeous. Those tones are so lovely and calming. Love the texture. I know it will be cherished, wherever it ends up. Beautiful work. Thank you so much for your kind compliments! This post came at a good time for me. Last year I bought an entire bolt of beautiful wool yardage with the intention of weaving a rag rug. However, I wanted to do something different versus my usual plain weave rag rug. As a relatively new weaver I have never done rep weave, nor have I ever heard of spaced rep weave. 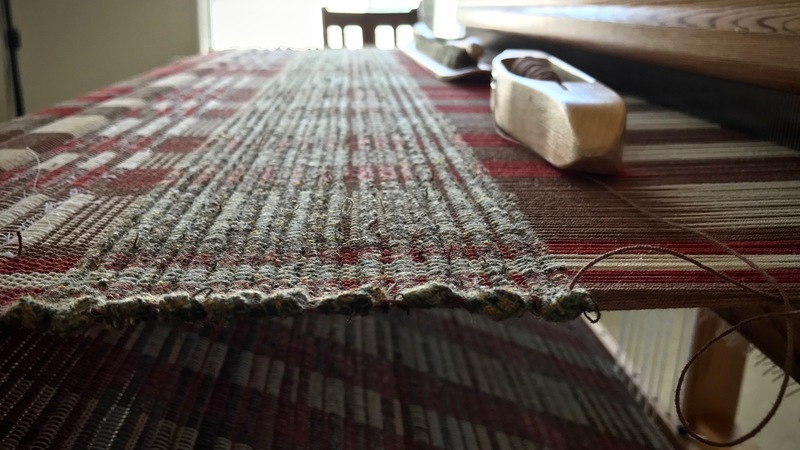 However, it looks like the perfect weave for rag rugs due to the fact that it compliments both the warp and weft. 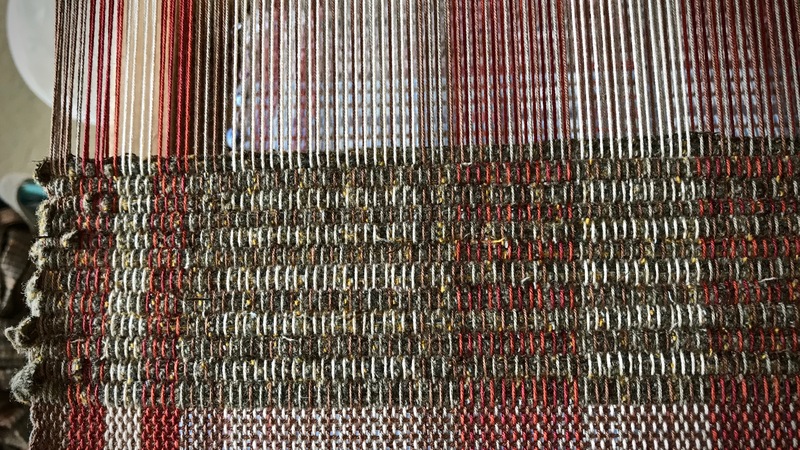 I’m going to give it a try, but can you point me in the direction of a resource where I might be able to find a pattern/draft for warping/weaving using spaced rep? Or, can you share with me the set you used? Also, it looks like you cut your wool rags at around 1″ — is that correct? Hi Kathryn, It makes me happy that you enjoy what you find here. You’re right, spaced rep weave is a great choice for rag rugs because you can design with the warp and enjoy the colors and patterns of the fabric weft. For this rug I started with a draft in Favorite Rag Rugs by Tina Ignell, a rug called “A Night in June.” I don’t know if the book is still in print. My warp is 12/6 cotton, in three different colors. I changed the design somewhat from the book, but it’s the same general idea. I am using a metric 40/10 reed, which is equivalent to a 10-dent reed. 1 end per heddle, 2 ends per dent. So, the sett is 8 ends per cm, or 20 ends per inch. This is woven on 4 shafts with 2 treadles, threaded like rep weave. I am cutting the wool strips at 1.5 cm, which is about 5/8″. 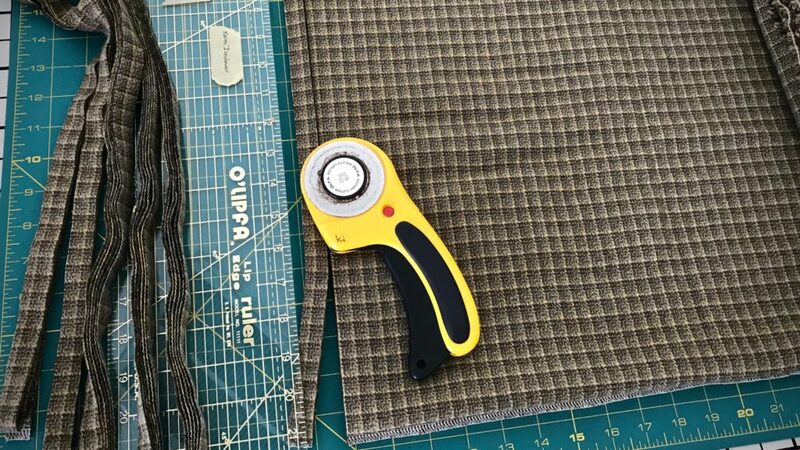 I normally cut rag rug fabric at 3/4″, but because this is a closer sett I am cutting the strips a little narrower. And for the hem, I am cutting the strips just a little more than 1/4″. These are great questions. Thanks for asking! I look forward to hearing how your wool rag rug is coming along! Thanks so much Karen for the thoughtful reply. Recently, I was lucky enough to locate a copy of Tina’s book from a used bookstore here in Oregon. It’s a great source of inspiration! Kathryn, I am so happy to know that you have a copy of the book! I know it can be hard to come by. Yay, you have some great projects there you can try. I discovered your blog today. Someone shared your link in a group that I’m a member of. Thank you for sharing your rug weaving experience, but most of all, thank you for the way you share Jesus. Hi Marilyn, It’s a pleasure to have you along! I’m grateful that I get to share what’s in my heart. Thanks for your encouragement.